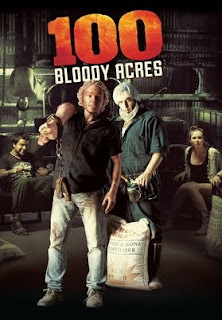 An Oz twist on the American-dominated hillbilly horror sub-genre, this has a trio of city folks, en route to a music festival, who break down and end up getting picked up by Damon Herriman who, with his brother, runs a bone fertiliser business that has unwittingly got them into using real liquidised human corpses. Herriman is the kind of well meaning putz-turned-unwitting-murderer familiar from Corman black comedies of the 50’s and 60’s like BUCKET OF BLOOD and LITTLE SHOP OF HORRORS. The premise is really just a contemporary Aussie variant on COMEDY OF TERRORS, with the added broad satire of Oz city / country stereotypes. TUCKER AND DALE VS EVIL is an obvious recent influence but there’s a disappointing absence of wit or appealing characters. Too many jokes fall flat, and it’s awkwardly paced for a horror comedy, though the finale offers a lively mix of dog kicking, old lady shagging and body mincing. John Jarrett, something of an Oz horror icon since WOLF CREEK, has a cameo as an ill-fated cop.